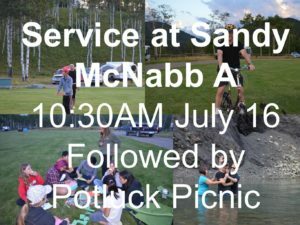 July 16 Service in the Mountains! This Sunday is our annual baptismal service in the mountains! And the forecast is sunny and 26C! WHEN: Communion service at 10:30AM Sunday July 16 followed by baptism in the river. Then picnic potluck at noon. Done by 2PM. 21km west of Turner Valley on highway 546. It is approximately 90 minutes door to door. WHAT TO BRING: A lawn chair, something to drink, food for the potluck (whatever you like). Plates, cutlery, napkins will be provided. There is no cell service at Sandy McNabb. There is no English service at the ECC on Sunday.